1. Soak cedar plank in water for 20 – 30 minutes. 2. Mix light mayonnaise, dill, mustard, lemon juice and black pepper in a small bowl. 3. Cut salmon into three servings. 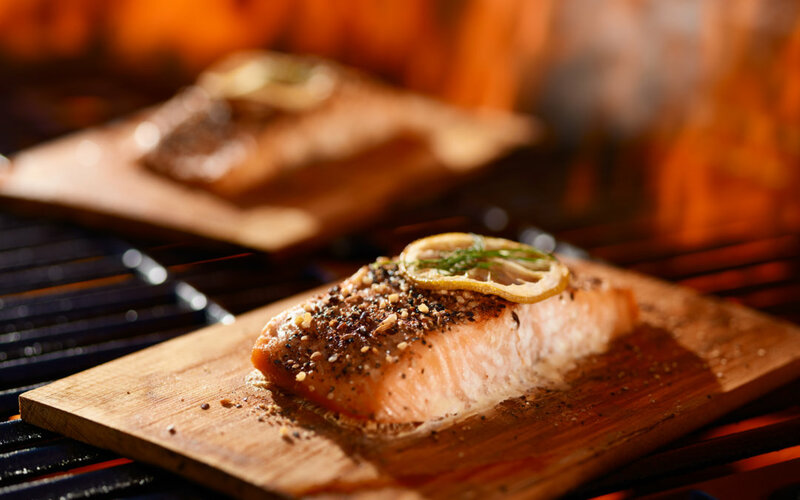 Remove cedar plank from water and place salmon on the cedar plank. 4. Remove approximately ½ of the mayonnaise mixture into a clean separate bowl, cover and set aside in the refrigerator. This will be used to make the final sauce served on the cooked salmon and you do not want it to become contaminated from touching the raw fish. 5. Using a clean spoon to avoid contamination from the raw fish, spread a thin layer of the remaining mayonnaise mixture on the salmon servings on the plank. 6. Preheat outdoor grill on high temperature. Grill salmon on the plank for 5 – 10 minutes until cooked through. 7. In the meantime, add Greek yogurt to the set aside portion of the mayonnaise mixture which has not touched the raw fish to make a sauce to serve with the salmon.